We invite you to swim, sun, fish, boat, and relax - just have fun and enjoy your stay at Mascoma Lake Campground. Our campground is for all ages and all types of camping. We take pride in our grounds and facilities and offer a clean, well maintained, and picturesque camping facility, which can accommodate your camping needs. We take pride in the fact that our campground is family friendly. 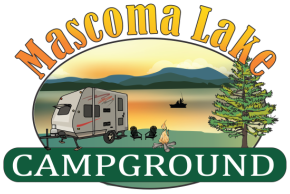 When you're looking for a place to relax, read a good book, enjoy boating (see our free non-motorized boat rentals), go for walks, take a swim, or ride along the bike trail nearby Mascoma Lake Campground is just the place for you! During your stay with us, enjoy the beautiful 5 mile lake and just sit back and relax. Our sites are situated on picturesque Shaker Mountain, terraced so that most sites offer a view of the water. Our campground is "family friendly" and "pet friendly", so you can plan your next camping trip with us with the utmost confidence. Located on the "quiet side" of New Hampshire, Quechee, Vermont, and Hanover, NH, are our neighbors. Because of the number of attractions in the area, you can look forward to days of fun-filled activity. Many of these attractions are readily accessible from Routes 89 & 91. Our camping season extends from early May to mid-October, so plan ahead for your vacation or weekend getaway. And please, check out the rest of our website to catch a glimpse of our facilities, this year's activities, local attractions, photos, and much, much more. Call 603-448-5076 to make your reservations, or use our online reservation request form. For your convenience, we have included a complete map of our camping area. Overlooking Mascoma Lake in Lebanon, New Hampshire. Close to I-89 & I-91.